Enjoy exclusive sushi making class at the atelier morimoto XEX, one of the well-known morimoto restaurants in the world. During the class, an expert sushi chef gives detailed instruction of how to make nigiri-sushi and gunkan-maki (sushi wrapped with dried laver with the material on top). Cooking ingredients, tools and lunch are all included. Just bring yourself! Following the instruction of an experienced chef, you will make 8 pieces of nigiri-sushi and gunkan-maki. 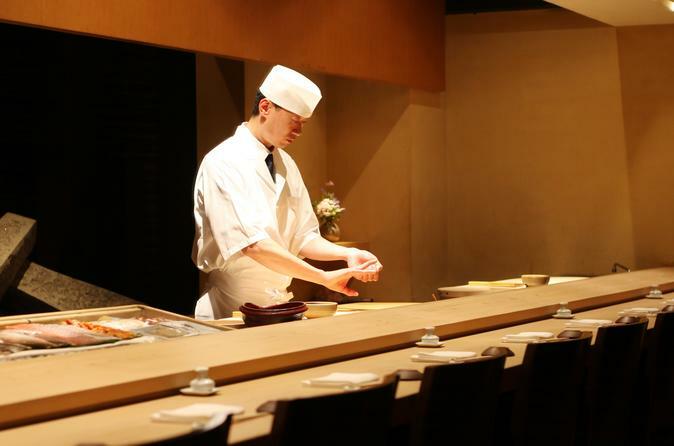 The chef will make sample sushi in front of you first, then you will follow the instruction to prepare your own sushi. With presence of expert chef, you can ask him whatever you would like to know such as history, traditions of sushi and how to throw sushi home party. Finish your cooking experience at 13:00pm by enjoying your creation with your friends, family and partners. Lesson will be about 60 to 80 minutes and lunch time will be about 60 minutes.